I have had a lovely break in France and am back now to a sunny Cornwall, a pile of holiday washing and millions of emails to wade through. As part of getting my brain back into gear and ordering my studio time here is a list of shows and events for the rest of the year. 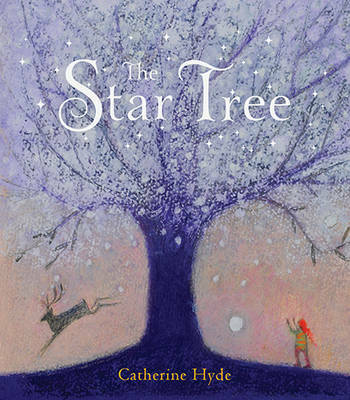 13th September: Launch of The Star Tree at Waterstones, Truro – more details to follow soon. 20 – 23rd October: Affordable Art Fair, Battersea represented by Lighthouse Gallery, Penzance. 22nd October: Book signing event at Number 7, Dulverton. Number 7 is a delightful Aladdin’s Cave full of magical things and I can’t wait to visit them again. 12th November: “The Running of the deer” solo show at Foss Fine Art in Battersea – slightly later than previously stated but maybe better for being closer to Christmas as the theme of the work is all things Winter. Inspired by poems and traditional carols it is going to be a sumptuous celebration of all that I love about the changing of the seasons, the shortening of the days, the lighting of candles and fires. I will also be showing original spreads from the Star Tree and the books will be available. This wonderful review at http://awfullybigreviews.blogspot.co.uk/ is by award winning author Saviour Pirotta whose Firebird I was lucky enough to illustrate in 2010. I have to confess that I’m a bit biased when it comes to Catherine Hyde’s work. She illustrated my 2010 version of Firebird, which earned us some fantastic reviews and an Aesop Accolade in the US. Catherine had already illustrated Carol Ann Duffy’s The Princess’ Blankets before she worked with me and she went on to team up with Jackie Morris for Evie in the Wild Wood. This, however, is the first book that she has written and illustrated herself. Here is a dreamy, lyrical story of a girl who makes a wish on the moon. It is midnight on midsummer’s eve, a time when all wishes come true. And so starts a magical picaresque journey that will take Miranda from her warm seaside home to the frozen North where the fabulous star tree grows. She is helped on her way by magical creatures of the night: an owl, a hare, a bear, a stag and finally a silver-feathered goose. Will she find the magical star tree? Catherine Hyde’s pictures are always mesmerising and here she employs a pontillist style to great effect, giving the book a very organic feel. It feels almost like some of the pictures formed naturally on the page, like lichen patterns on old stone or cherry blossom petals on a late-spring lawn. The text, almost a poem, is carefully crafted, inviting you to turn the page and accompany Miranda on her enchanted journey. All in all this is a wonderful bedtime treat you would want to revisit again and again, both for the story and the enticing pictures. Saviour Pirotta’s next book Ballet Stories for Young Children will be published by Orchard in October 2016.